This is a major reference book from Mountain Training UK for every walker as well as for those who wish to lead groups in the UK and Ireland. It is split into three sections: getting around in the hills, the upland environment and party management, all of which contain colourful illustrations, photos and maps which bring essential techniques to life. 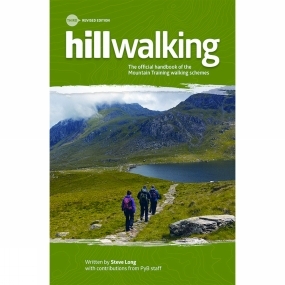 This book has been written by Steve Long, with contributions from Plas y Brenin staff, and provides an indispensable guide to the skills required for summer hill walking.The book covers every aspect of walking in the hills: route finding, navigation, clothing and equipment, camping, access and conservation, the environment, the weather, party management, hazards and risk management, dealing with incidents and first aid.This fully updated third edition includes new information about access to the hills and advice for leaders working with people with disabilities. The navigation section has also been expanded to include major updates about digital mapping and GPS devices in this increasingly technological age.In 2014 the publisher, Mountain Training, celebrated 50 years of leading the way and currently overseas thirteen personal skills and leadership schemes in walking, climbing and mountaineering. This book is the official handbook for the Mountain Training walking schemes and is endorsed by the British Mountaineering Council, Mountaineering Council of Scotland and Mountaineering Ireland.